Authors: David Coleman Mac Callaham D. Crossley, Jr. 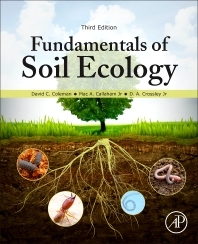 Fundamentals of Soil Ecology, 3rd Edition,　offers a holistic approach to soil biology and ecosystem function, providing students and ecosystem researchers with a greater understanding of the central roles that soils play in ecosystem development and function. The text emphasizes the increasing importance of soils as the organizing center for all terrestrial ecosystems and provides an overview of theory and practice in soil ecology, both from an ecosystem and evolutionary biology point of view. This new edition is fully updated, including an expanded treatment of microbial ecology and new sections on advances in molecular techniques and climate change research. These updates make this edition an essential resource for researchers and students in soil ecology and microbiology. Mac Callaham is a Research Ecologist with the USDA Forest Service’s Southern Research Station in Athens, Georgia. He has 25 years’ experience of working in soil ecology with projects ranging from agroecology to ecotoxicology to grassland and forest restoration and management. Following graduate school at Kansas State University, he held post-doctoral positions at Oak Ridge National Laboratory (2000-01), and with the USDA Forest Service at Clemson University (2001-03). In 2005, Callaham became a Team Leader within the Center for Forest Disturbance Science, a unit of the Forest Service’s Southern Research Station In 2005, Callaham was awarded the Southern Research Station Director’s Award for Early Career Scientists. Having long been interested in international research, Callaham was awarded a Fulbright Scholarship in 2010 to participate in research in southern Brazil with a focus on restoration of Atlantic rainforest ecosystems. In 2014, he received a Visiting Professorship for Senior International Scientists appointment from the Chinese Academy of Sciences to instruct a course on soil ecology at the Northeast Institute for Agroecology and Geography in Changchun, China. Callaham serves on the editorial board for Applied Soil Ecology, and had been guest editor for peer-reviewed special issues of the journals Pedobiologia, Applied Soil Ecology and Restoration Ecology. Dac Crossley is a Professor Emeritus of Ecology at the Odum School of Ecology, University of Georgia, Athens, USA. He served as Director the Graduate Program in Ecology, at the Institute of Ecology at UGA since its inception. He was Principal Investigator of the Coweeta Long-Term Ecological Research site in North Carolina. He has served as editor and reviewer of numerous ecological and entomological journals. He currently serves as an associate curator at the Georgia Museum of Natural History where he curates the soil mite collection.